For those that might be new to the world of creating music all on your computer or new to the world of synthesis and sampling, I thought a brief mention of what I use would be in order. There are many very good comparable products available from many sources, but for the cost, the unified look & feel and overall quality, I really like Native Instruments and their products. If you want everything, then Komplete Ultimate 9 is the one to get. You can spend years playing around and putting this software to use. It is pricey, but consider it a worthwhile investment, especially if you anticipate making money from your music or as an educational investment. But, if you don’t want to spend that much, individual parts are available. Reaktor – A modular synthesizer with lots of instruments and, best of all, the ability to create your own instruments. With just the above programs and their factory content, you can do more than enough to get really great sounds. Kontakt & Reaktor are the main ‘engines’ on which most of the rest of the content relies. With Kontakt, there various libraries that come with Ultimate (or are available separately). Those include Strings & Cinematic libraries like Session Strings, Session Horn, Session Strings Pro, Damage, Evolve and Evolve Mutations 1 & 2. If you want to do anything for TV, Film, video games or just generally dramatic music, these are great. For retro sounds there is Retro Machines MK2. There are several drum packages in the Abbey Road series including Vintage, 60’s, 70’s, 80’s & modern drummer. There is also a Studio drummer. These drum packages give you drum kits, thousands of midi grooves and effects appropriate to those eras. To round out the drums, there is a West African drum collection, Balinese gongs and samples from Maschine. If that weren’t enough, there are several electric bass instruments and guitar. Finally, there are keyboard libraries. These include classic rock organ (B3), several grand pianos, upright pianos, including The Giant, electric pianos, retro keyboards, and a soul loop library. With Reaktor, the instruments included are: Razor, a great additive synth; Reaktor Prism, a modal synth; Reaktor Spark, a dynamic subtractive synth; Skanner XT, part synth, part sampler; Monark, a new analog emulation similar to a mini-moog. Remember, these are just the added libraries that come with Reaktor. 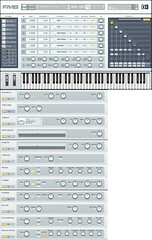 Reaktor itself has hundreds of synths, samplers, sequencers & effects including in the base package. On top of all of that, NI includes numerous effects as plug-ins ready to be inserted into your DAW. (It should be noted that many of the above products include versions of these plug-ins as part of their implementations). These include a variety of solid state and tube emulations of compressor/limiters, EQ, reverb, gates, transient master, driver (distortion & filter effect), The Finger & The Mouth for live performance or studio manipulation of sound; and Reflektor, another reverb. If you’re just getting started and don’t want to invest in all of these sounds just yet, I would recommend either Kontakt or Reaktor depending on your interest. If you want to design your own synths and get into the world of sound design, then go with Reaktor. If playback and maybe taking sounds you already have and making into an instrument is for you, then Kontakt. Each of these are available in a free versions with limits on what you can do with them. But, they do come with sounds that can be used in a production. Think of them as demos to get your feet wet before deciding what to do. As to learning about them, the manuals that come with Ultimate are pretty good. There are also videos from various sources. I have some on my YouTube channel (as shown below). I also like Groove3.com for their tutorial series. In addition to the tips you can find on my YouTube channel, I offer this. To start with, for the synths, take any piece of music you are familiar with, load it into your favorite midi sequencer or midi track of your DAW and start assigning different instruments to it. For effects, use an audio track with GuitarRig or the plugins. Mess around with the various knobs on the software and/or use automation in your DAW in order to vary the sounds. Personally, I use the Reaper DAW. Great for the price and great for what it can do. I’ve been using Ultimate 9 since it came out and am very impressed with it. As an updater from a previous version, I think there are just enough new products included to make the upgrade worthwhile (assuming you didn’t buy any of the libraries when they came out individually over the past year or so). The effects package and Battery 4 definitely deserve a good going through.